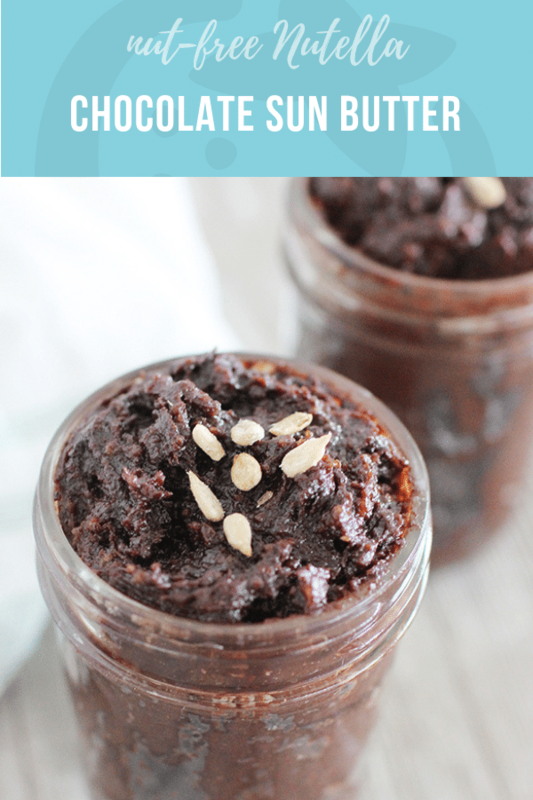 Sweet Chocolate Sunbutter is a decadent spread that’s high in protein and healthy fats. Since it’s nut-free and school safe, go ahead and pack this sunbutter in kids’ lunches and snacks… it’s like nut-free Nutella! If you’ve tried the sweet, cinnamon-y sunbutter recipe we’ve shared before, you know how simple and addictive homemade sunbutter can be. And if you’ve tried, well, anything chocolate before… you know that chocolate is always fabulous. So it was only a matter of time before we combined these two great flavors into one delicious, nutritious, and decadent spread. Chocolate Sunbutter is quick to make in your food processor, and made from minimally processed ingredients like dates, maple syrup, unsweetened cocoa powder, and a splash of almond milk. Your kids will fall for the look–like frosting! !–before they even have their first taste. Then they’ll fall for the sweet flavor and crunchy/smooth texture of this satisfying spread. 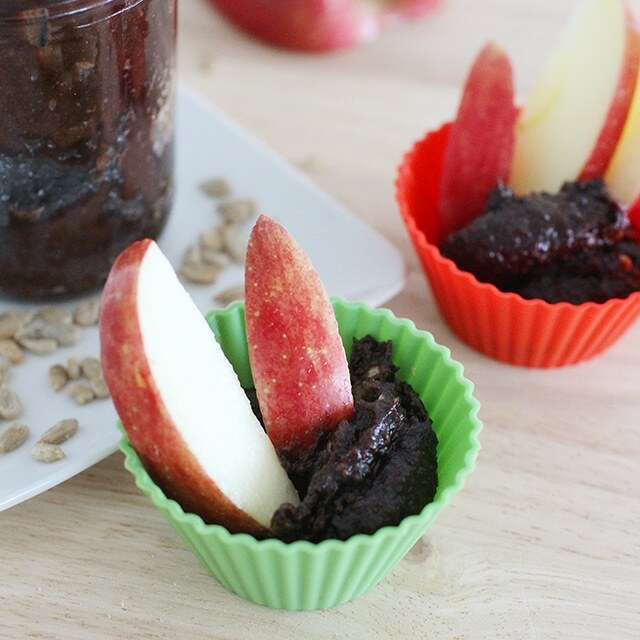 Our favorite way to serve Chocolate Sunbutter is in a little dish next to fresh cut fruit. Try firm fruits like apples or Bosc pairs, since the consistency of the spread is fairly thick. Sunflower seeds: so humble, but so healthy! These little seeds pack in plant proteins, healthy polyunsaturated fats, vitamin E, selenium, and other minerals that help set the stage for a lifetime of good heart health. Chocolate Sunbutter can stand in for nut butters for kids who have allergies to nuts. That means it’s also safe to send to school! So you can pack Chocolate Sunbutter in your kids’ lunchboxes, with some fresh cut fruit or whole grain crackers on the side for dipping. 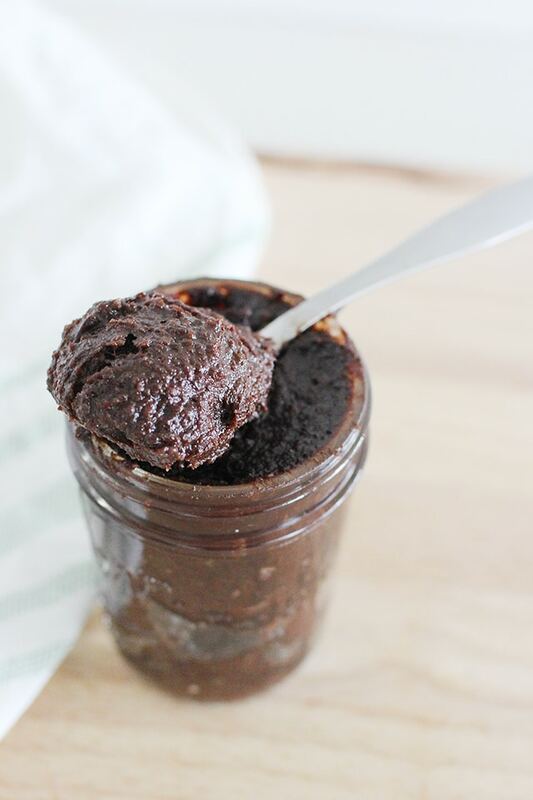 This chocolatey spread also tastes rich and sweet without a crazy amount of sugar. Two tablespoons of Nutella contains 21 grams of sugar… five whole teaspoons worth. The same amount of Chocolate Sunbutter only has three grams of sugar: a hair under one teaspoon. And the sweetness comes from whole dates and pure maple syrup, not refined sugars. 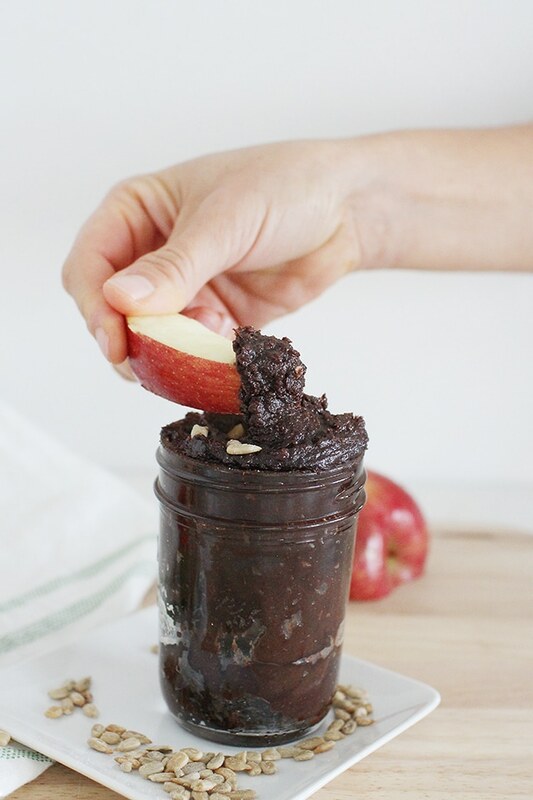 The takeaway: have another apple slice slathered in Chocolate Sunbutter. This recipe is simple to make, and comes together entirely in your food processor. Buzz up the seeds first, until they form into a ball that starts rolling around in circles in the food processor cup. Then add the remaining ingredients and process further, until the sunbutter is evenly-colored and -textured. Store leftover Chocolate sunbutter in the fridge, but let it warm up to room temperature before serving, for the most dippable texture.